Description: Japanese Meiji Period hand embroidered FUKUSA. 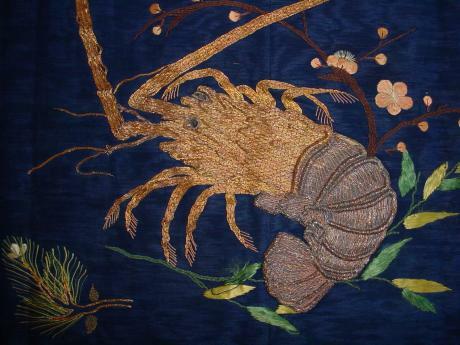 Spiney lobster is emroidered with gold and silver covered threads on a navy background. Branches of the 3 friends, PINE, BAMBOO and PLUM BLOSSOMS are also embroidered on the piece. 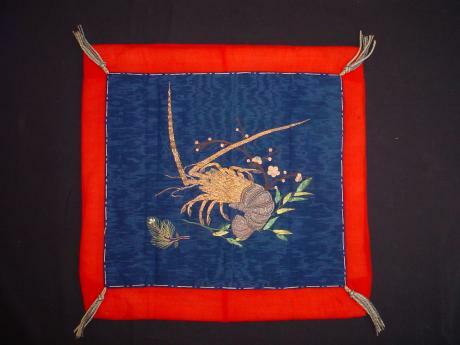 Navy fabric is framed and backed with red CHIRIMEN silk. 22" wide by 21" long.